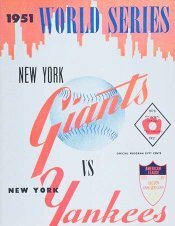 The 1951 World Series matched the two-time defending champion New York Yankees against the New York Giants, who had won the National League pennant in a thrilling three-game playoff with the Brooklyn Dodgers on the legendary home run by Bobby Thomson (the Shot Heard 'Round the World). In the Series, the Yankees showed some power of their own, including Gil McDougald's grand slam home run in Game 5, at the Polo Grounds. The Yankees won the Series in six games, for their third straight title and fourteenth overall. This would be the last World Series for Joe DiMaggio, who retired afterward, and the first for rookies Willie Mays and Mickey Mantle. This World Series also matched up two of baseball's most colorful managers, Casey Stengel of the Yankees and Leo Durocher of the Giants. This was the thirteenth appearance by the Giants in Series play, their ninth loss, and their first appearance since the 1937 World Series. "The Commerce Comet arrives on the final voyage of the Yankee Clipper." The 1951 World Series was the first for Mickey Mantle and the final for Joe DiMaggio. Mantle's bad luck with injuries in the major leagues began here. 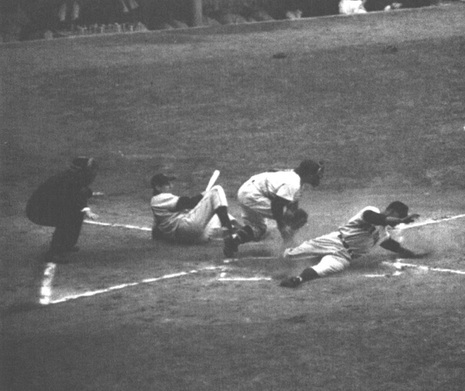 In the fifth inning of Game 2 at Yankee Stadium, Mays flied to deep right center. DiMaggio and Mantle converged on the ball, DiMaggio called Mantle off, and Mantle stutter-stepped, catching a cleat in a drain cover, and fell to the ground in a heap with a wrenched knee as DiMaggio made the catch. Mantle was done for this Series, but would come back to play many more. New York City became the first city to host an NBA Finals and a World Series in the same calendar year. The '51 season has been referred to by some as "The Season of Change" as it witnessed the departure of several of the games veteran superstars and the introduction of a new generation of talent. Many of the games biggest names from the previous two decades were nearing the end of their careers and the empty spaces on the line-up cards would need to be filled by players of the same caliber. Luckily for the managers (and the fans), there was no shortage of up-and-coming talent in the various farm systems around the league. Several new rookies on the scene included a young switch-hitter named Mickey Mantle and a phenomenal fielder named Willie Mays. The nineteen year-old Mantle was called up to the big leagues from the Yankees Kansas City franchise and hit thirteen home runs in ninety-six games. Mays had been called up in late May by the Giants from their Minneapolis team (where he was batting .477) and the twenty-year old responded with twenty homers of his own. It seems fitting that in their first year of professional play, both future Hall of Famers found themselves competing against one another in the biggest game of the year; the 1951 World Series. The Giants had steamrolled their way to the Fall Classic and were determined to dethrone their world champion, cross-town rivals. Manager Leo Durocher's team had rallied to win the National League pennant after trailing the Brooklyn Dodgers by 13½ games. Beginning August 12, the Giants won sixteen consecutive outings and thirty-seven of their last forty-four to forge a tie for the top of the National League with Brooklyn. They went on to beat the Dodgers in a best-of-three playoff, ending with the infamous Thomson three-run homer off Ralph Branca that gave the Giants a 5-4 victory in the third game at the Polo Grounds. With Brooklyn out of the way, the Bronx was next and the Giants wanted to prove that the last team standing was truly "New York's baseball team". Things continued to go the Giants way as they went on to shock the Yankees in a 5-1 Series opening triumph. Dave Koslo held the Yankees to just seven-hits and Alvin Dark came up big with a three-run homer. Monte Irvin was the game's "MVP" though with three singles, a triple and the first Series steal of home plate since the Yankees' Bob Meusel snatched the bag in 1928. Eddie Lopat got his team back in the running in Game 2 while pitching a five-hitter and adding a run-scoring single in the 3-1 victory. However, the biggest play of Game 2 involved a devastating injury that would haunt the New York Yankees for years to come. Willie Mays had led off the top of the fifth with a high shot to right-center in what was to be an easy fly-out. Centerfielder Joe DiMaggio prepared to make the catch while Mickey Mantle followed from rightfield in pursuit. According to several sources, Yankees manager Casey Stengel had instructed Mantle earlier to "take everything he could get" as " Joe D" was in the twilight of his career. 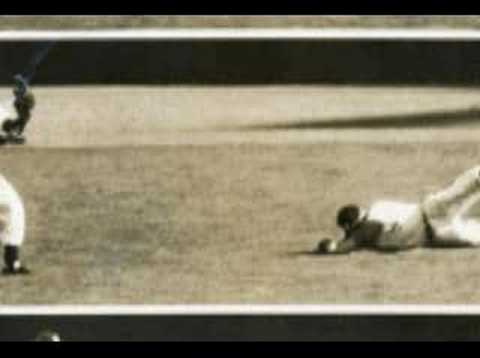 The nineteen-year old speedster pulled up at the last second as DiMaggio made the play and caught his foot on the wooden cover of a drainage outlet. His knee buckled forcing him out of the Series and instigating the start of several leg problems that would haunt Mantle for the rest of his eighteen-season career. Game 3 remained anyone's for 4½ innings as the Giants held on to a slim 1-0 lead. All that would change though as the National League champs would capitalize on a crucial error by their American League rivals. With one out in the fifth, Eddie Starky managed to coax a walk off of Series veteran Vic Raschi. The Yankees, thinking the Giants were about to play a "hit-and-run", "run-and-hit" or "straight steal", called for a "pitchout" and catcher Yogi Berra responded with a perfect throw to shortstop Phil Rizzuto in plenty of time to catch Stanky. However, the determined veteran kicked the ball out of Rizzuto's hand on the slide and scrambled up and onto third. Instead of two out and nobody on, Stanky was standing firm on third with only one out. Dark scored him in on his next single and Whitey Lockman delivered the final blow, a three-run homer for the 6-2 victory at the Polo Grounds. With a two-games-to-one lead in the Series and Games 4 and 5 also at home, the Giants were in a favorable position. Their momentum was slightly stalled though as Game 4 was postponed for a single day due to rain. The inclement weather had allowed the Yankees to rest Game 1 loser Allie Reynolds and the "Bomber's" ace responded the following day with a clutch, 6-2 win over the Giants' Sal Maglie. "Joe D" added his eighth (and final) World Series homer and the Yanks were back in business. The victory by Reynolds inspired his fellow pinstripes and they went on to crush the Giants 13-1 in a Game 5 massacre. Yankees utility infielder Gil McDougald, who alternated between second and third for Stengel's club, nailed a bases-loaded homerun in the third off Larry Jansen. The rocket, which broke a 1-1 tie, was only the third World Series grand-slam (Cleveland's Elmer Smith in 1920 and the Yankees' Tony Lazzeri in 1936). Game 6 was a real nail-biter as both teams went head-to-head for over five innings. With the bases loaded and two out in the sixth, Yankees outfielder Hank Bauer stepped up to the plate against Dave Koslo attempting to break through the 1-1 tie. For Bauer, it was the perfect opportunity to shake off his World Series despair. In thirty-eight previous at-bats in the Fall Classic, Bauer had collected only five hits (all singles), a .132 Series batting average and only one RBI in postseason play. This time the former United States Marine came through with "flying colors" with a bases-clearing triple. Then in the ninth, after the Giants closed within one and had the potential tying run in scoring position, a racing Bauer made a sensational 4-3 game-winning catch on a hit by pinch-hitter Sal Yvars. Once again, the Yankees had ended the Giants "Cinderella" season and although the Series was nothing compared to the National League playoff in terms of memorable moments ("The Giants Win The Pennant! "), it was a sweet ending for some and a new beginning for others; Game 6 marked the final Major League game for the Yankee Clipper, Joe DiMaggio, who was headed for retirement at age thirty-six, Mantle would appear in eleven more World Series, and Mays would compete in the Fall Classic three more times. The Yankees were now 14-4 in World Series appearances and 1951 marked the start of what would become their second dynasty.